Poison ivy, poison sumac and poison oak are the single most common cause of allergic reactions in the United States. Each year 10 to 50 million Americans develop an allergic rash after contact with these poisonous plants. Indirect contact – touching something to which urushiol has spread. The oil can stick to the fur of animals, to garden tools or sports equipment, or to any objects that have come into contact with the plant. Airborne urushiol particles, such as from burning plants, may come in contact with your skin. Once urushiol touches the skin, it begins to penetrate in minutes. In those who are sensitive, a reaction appears as a rash in the form of a line or streak, usually within 12 to 48 hours. Redness and swelling occur, often followed by blisters and severe itching. In a few days, the blisters may become crusted and begin to scale. The rash takes 10 days or longer to heal. The rash can affect almost any part of your body, especially where your skin is thin, such as on your face. A rash develops less often on the soles of your feet and palms of yours hands, where the skin is thicker. The rash does not spread, although it may seem to when it breaks out in new areas. This may happen because urushiol absorbs more slowly into skin that is thicker, such as on your forearms, legs and trunk. Sensitivity varies from person to person. Only about 15% of people seem to be resistant though sensitivity tends to decline with age. Some people can develop a severe rash with blisters and extreme swelling on their face, arms and legs. Such severe cases need medical treatment. Learn to identify this toxic plant. It can grow as a shrub or a vine. It is most dangerous in the spring and summer when there is plenty of sap and the plants easily bruise. 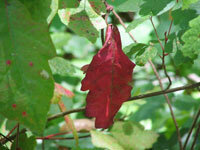 Prevent the misery of poison oak by looking out for the plant. If you are going to be where you know poison oak likely grows, wear long pants and long sleeves, boots and gloves. Remember that the nearly invisible oil sticks to almost any surface. KEEP PETS UNDER CONTROL ON A 6’ LEASH AND AWAY FROM POISON OAK, AS THEY MAY CARRY URUSHIOL HOME ON THEIR FUR. 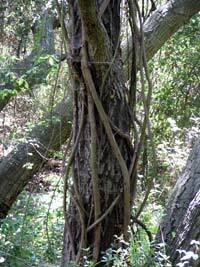 Because urushiol can even travel in the wind if it burns in a fire, do not burn plants that look like poison oak. Barrier skin creams offer some protection before contact with poison oak. These over-the-counter products prevent urushiol from penetrating the skin. Wash all exposed areas with cold running water as soon as you can. If you can do this within 5 minutes, the water may keep the urushiol from contacting your skin and spreading to other parts of your body. Within the first 30 minutes, soap and water are helpful. Wash your clothing and footwear with detergent– urushiol can remain active on unwashed items for months. If you bring the clothes into your house, be careful that you do not transfer the urushiol to rugs or furniture. Relieve the itching by taking cool showers and applying over-the-counter preparations like calamine lotion or Burrow’s solution. Soaking in a lukewarm bath with an oatmeal or baking soda solution also may ease itching and dry oozing blisters. Over-the-counter hydrocortisone creams are not strong enough to have any effect on poison oak rashes. In severe cases, prescription cortisone can halt the reaction if used early. If you know you have been exposed and have developed severe reactions in the past, consult your dermatologist. Scratching blisters will spread the rash. False. The fluid in the blisters will not spread the rash. False. A person’s sensitivity changes over time, even from season to season. False. Urushiol remains active for up to several years. Never handle dead plants that look like poison oak. One way to protect against poison oak is by keeping yourself covered outdoors. True. However, urushiol can stick to your clothes, which your hands can touch and then spread the oil to uncovered parts of your body.